So many wait to begin at the beginning; of the New Year, of the week, of the next perceived starting point. Yet what are we doing while waiting for that perfect moment? In some cases one actually undermines the future opportunity that lies ahead. How many times is a diet or exercise program preceded by splurging on rich food and indulging in couch time? We put off, we set aside, we make poor choices with the promise of doing better; all common behaviors. Waiting for that perfect time to begin, so many hours and days are left languishing, sliding away, unused, unrecoverable. Many long for more time to follow pursuits that seem distant, yet killing time is a common device. More than any other benefit, mindfulness offers us more time. Each moment that we can maintain our mindful presence is one well used adding to the storehouse of experience, knowledge and memory. Arriving at one’s destination having seen each sight, breathed the scents of the place, with the feel of the swirling air of the present on one’s skin, the journey becomes a piece of us. There are dozens of lists detailing how to make the most of one’s down time; waiting being so much a part of the many errands we run. Bring a book, write a list, call a friend; each useful and certainly productive. But could we not also add breathe, listen, look about, dip you hand in the fountain? As this day of fresh starts becomes the next and the next, let us remember that we can wait until the next day or hour to become present in this moment. We are here, we are now, and the storehouses of our lives are filled to the brim with all there is when we give over each instant to mindfulness and intent. Rereading the chapter in Tolstoy’s work “Family Happiness” from which this quote springs reminds me that this is about the sorrow of love that has changed and dissipated over time. Yet I chose the quote for altogether another reason. It brought to mind the ever-changing focus of the love that we hold within, and the varied expressions as one passes through each phase of life. The last few days I have thought about how much I love my life; especially that in this time in my life I have allowed myself to choose a path and take the steps that carry me fully in the direction I intend to go. In the past, I felt carried along on a tide of which I had no control and felt helpless to tug against. Yet in reality I was making choices and often they were taking me in a direction that was rewarding and suited me well. It is only in this time of life that I am able to reflect on the nature of the lasting loves and the newfound love of my way of life. I now more clearly understand the steadying nature of the love of a long marriage, one that has certainly seen its share of heartbreak, but has endured in spite of all we did to harm it. The love of my children has grown and changed dramatically over the years. At its inception it was a strong physical bond, wrapped in desire to protect and shelter, the need to hold them close. As they grew, I loved who they were, even as the physical bond lessened, the emotional bond grew. Even later as the struggle to hang on and let go all in the same movement, love became something to come back to when confusion and disconnects threatened. And now I enjoy the love of acceptance, loving them for who they are and aspire to become, much as I have finally learned to love myself. As the awful burden of expectations has fallen away, the underlying beauty of the fact of their beings returns to me as it was in the first hours of their existence. Ultimately this love is such a powerful presence in my awareness and appreciation as a result of the great gift of being present in the moment and looking not forward, but all around. This time of life has offered up, and I have gratefully accepted, love of place, love of life, love of home and family, and the ability to revel in each of these. Wisdom is not something one can seek as much as something that descends upon us when taking the time to sit with life and let its lessons reveal themselves. For me it was slowing my reactions and responses to offenses real and imagined. Quick to imagine less than kind intent in the smallest slight, I internalized these and my responses became even more rapid. When I was finally able to step back, and let the events rest on their own, I began to see the people behind the supposed offense. To see more clearly required time for observation and reflection. Mindfulness took away the urgency; not just being in the moment, but paying close attention to my responses. With my new-found intimacy with the present I discovered that Patience also yields Wisdom. They are inseparable and one continued to benefit the other. I suspect that wisdom is closely associated with age not so much due to accumulating experience, but the natural slowing of the pace of life that gives one time to put that experience in perspective. The added awareness that life is short, when it becomes rather obvious with age, results in a softening of the edges. The lack of benefits to taking offense push it to the “why bother ” ledger as I search for those things with the greatest payoff in the least time. Have I gained wisdom and patience? I like to think I have grown in that regard as much as in any other. Losing the habit of taking offense and then feeling compelled to act, leaves more time for joy and acts of kindness. Just because you take a break from something, no matter the duration, you can always come back and pick it up again. This goes for hobbies, a project you’ve lost interest in, a stubborn problem that needs a new approach. Stepping away is not quitting and likely when you return it will be with a renewed and refreshed point of view. In the past, once I had stepped away I would begin the process of berating myself for being a “quitter” and never finishing anything. Once I was thoroughly beaten down, starting again was daunting. This time I gave myself permission to take a break, and a general timetable to return and best of all realized that there is no finished, just done for now. Sometimes when life is bleakest, the reward for persevering is a powerful moment or one of extraordinary beauty. This comes from sitting with some of my lowest feelings over the years and reflecting on the grace bestowed upon me when I emerged from despair. It came together in stunning visual clarity after I spent 14 long hours behind the wheel, in driving rain for a large part and on a dark, rainy, windswept mountain road at the end. My reserves spent, I was fully focused on avoiding becoming another highway statistic. After stopping for the night, I returned to the road to finish my drive home and the stunning beauty of a river gorge awash in fall foliage greeted me and was my companion for much of the day as one river became another and the colors ranged from molten gold to deepest bronze. It isn’t personal, even when it is. A long list of events in the last few months, any of which would have sent me to a corner in a funk in the past, sailed right by with hardly a ripple. The difference is in my self-talk, a change in perspective that has allowed this shift to occur. Even in one particular situation when a friend said, “that is such a slap in the face”, and perhaps it was. I took it as the other person having an agenda different from mine and since she was the decision maker, her agenda took precedence. At this rather late juncture in my life I am able to see that I do not need to take ownership of another’s opinion of me, that I do not need to take something personally even when it was the intent. Some might say that the fight has gone out of me, and I suppose when one finds oneself at peace, that is true. The fire, passion and enthusiasm have not waned though, and those are the traits I cherish most in myself and others. Being mindful in the moment, giving myself time to sit with my feelings and reframe my expectations, choosing to find my peace wherever I am has given me greater clarity and wholeness. I look forward to resuming my daily writing, with even greater enthusiasm. 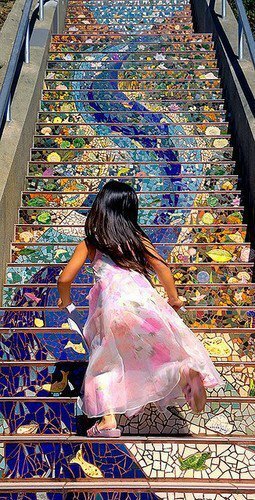 What if the right path presented itself as a dazzling staircase that we only had to climb to find ourselves exactly where we needed to be? Would we do it? Or would we look at the amazing path and tell ourselves; it is too high, it looks too slippery, I’ll come back to it later when I am not so busy, it might be an illusion? We have myriad ways to convince our-selves not to do the thing that we know is best for us, meant for us to do. I just finished a book that I cannot more highly recommend, “SWAY, The Irresistible Pull of Irrational Behavior” by Ori and Rom Brafman. It delves into the question of why we would do or believe something that makes absolutely no sense, and yet somehow we convince our brains, or vice versa in some cases, that it does. A fast-paced read on a topic that could change how you operate and best of all, how to get unstuck from a behavior or relationship you have tried to escape. If today the thought of one activity, one person, one idea, creates that spark of energy and imagination, then it is time to seize it with all you have. Don’t climb that staircase, run up the staircase, shout from the top, slide down the railing and run up again. Embrace this moment and give it your full attention and heart. All of the paths are there, the bright sparkling ones, the cool deep ones that lead into the enchanted forest, the precisely laid stone, the overgrown tangled vine laden paths. Which one intrigues you and calls you further along? The path that resonates inside is not the same for each of us, rather it is the connection we feel to that path that has grown inside us as we have passed by so many others knowing they are not the right one. Do not be cautious, do not choose with care! Fling yourself at your path with all the daring and courage that you can muster. The time for care and caution will be when you think you want to veer from that path to find another. Be sure you have explored this one fully and allow yourself the time to reflect whether you have merely come upon a log you must climb over or if it is the end of this path and time to find the next. And each time, let yourself light up, feel the thrill and magic of travelling exactly where you belong. It is not luck that one finds oneself on the right path, all that you need is being open enough to see it and brave enough to take it. Step quickly now, your path is right ahead!